Human organs from nanomaterials, particles penetrating the skin, quantum dots for cancer detection, and nanorobots that destroy toxic chemicals—what is all this about? Does such research help us to realize a sustainable future? How can we educate a new generation of nanoscientists and nanoengineers? A new book publication three and a half years in the making, titled “Handbook of Nanophysics,” gives answers to such important questions. 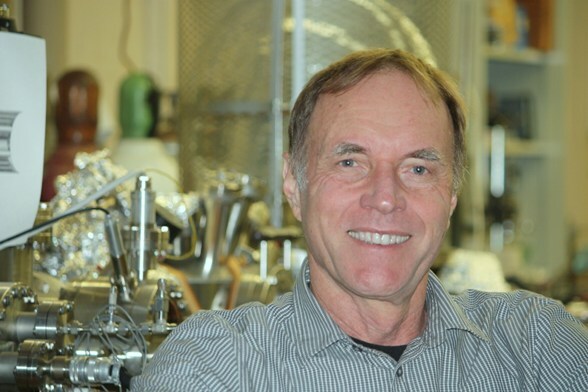 Published by CRC Press, it was edited by UH Mānoa Physics Professor Klaus D. Sattler, who directed the collaborative effort of 683 contributing authors from 47 countries. Even before its release, the book was widely considered to be a groundbreaking publication. In 1980, Sattler—a pioneer in the development of nanophysics—built the first atomic cluster source that became one of the foundations for today’s nanoscience. He operates a laboratory in the UH Mānoa Physics Department with highly sensitive scientific equipment for nanophysics research. Authors of the handbook, including two UH Mānoa faculty members, are from major national and international universities such as Harvard, Stanford, Berkeley, MIT, University of Chicago and the University of Austin. They reside in major cities such as Singapore, Paris, London, Tokyo, Beijing, Berlin, and also smaller countries including Bulgaria and Morocco. They are all world experts in their fields with profound knowledge of the state-of-the-art science. From the UH Mānoa campus, Chemistry Professor John Head has contributed with a chapter on “Predicting Nanocluster Structures,” and Professor Mehrdad Ghasemi-Nejhad of the Department of Mechanical Engineering has written “Smart Composite Systems with Nanopositioning.” Various other Mānoa faculty members have participated in the peer-review process of the handbook. “Handbook of Nanophysics” is the first comprehensive reference to cover both fundamental and applied aspects of physics at the nanoscale. A unique feature of the handbook is its science/tutorial hybrid style. Each peer-reviewed chapter presents a didactic treatment of the physics underlying the nanoscale materials and applications along with detailed experimental results. State-of-the-art scientific content is enriched with fundamental equations and illustrations. The handbook covers a broad range of topics: Principles and Methods (Vol. 1), Clusters and Fullerenes (Vol. 2), Nanoparticles and Quantum Dots (Vol. 3), Nanotubes and Nanowires (Vol. 4), Functional Nanomaterials (Vol. 5), Nanoelectronics and Nanophotonics (Vol. 6) and Nanomedicine and Nanorobotics (Vol. 7). The handbook consists of 304 chapters and 5,670 pages. In the last several years, nanoscience has experienced a tremendous increase in activity. About one million scientists are now involved in nano-scale research. Besides research done at the University and government labs, many studies are performed at industry labs. Corporations like Intel, Hewlett-Packard, DuPont, and especially IBM are also pioneering nanotechnology.